Shakers cards are cards that feature a moving item, or items, in the front of the card – usually sequins or confetti – inside a clear window. They’re perfect for if you’re feeling a bit more adventurous with your cardmaking and are a great way to add a fun, interactive element to an ordinary greetings card. It’s really difficult to get your hands on a shaker card without wanting to give it a good shake! Shaker cards usually feature an aperture secured with acetate, which creates a clear window for you to pop your “filling” inside. Depending on the theme of your card, the filling of the shaker part could vary - from buttons, to sequins or glitter, confetti, or even sand! 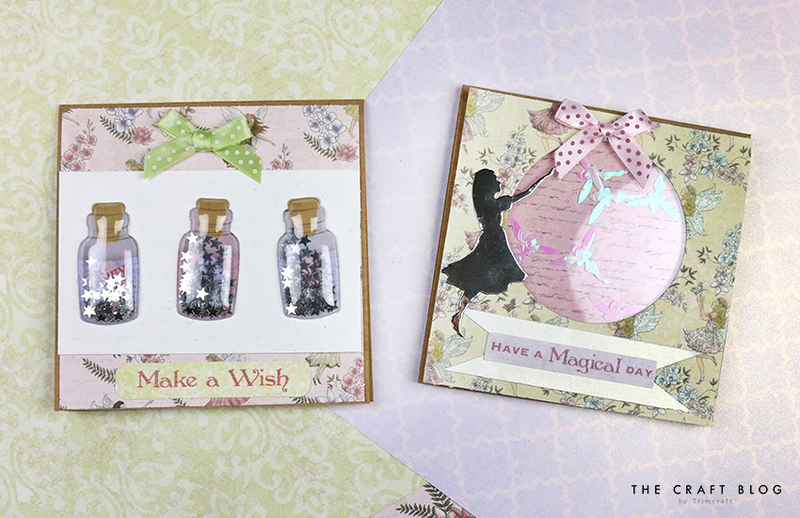 In our latest video, our talented Design Team member Christine is showing you how to make two beautiful shaker cards with the Dovecraft Fairy Tales collection. These cards are super easy to make if you’re new to shaker cards, or even cardmaking in general, and with our handy video you’ll be making your own in no time at all! What’s great is that we’ve managed to make the Shaker Card even easier to create too - as Christine demonstrates in our fun video. In our Fairy Tales collection, you can find a selection of amazing shaker stickers in the shape of cute fairy dust bottles and circular designs to add lots of intrigue to your makes. These self-adhesive puffy stickers feature star sequins inside to help you add lots of magic to your cardmaking with little effort! What did you think to these designs? We love the adorable elements from this collection, which you can find out more about here. Will you be giving these shaker cards a try? We’d love to see if you give Christine’s tutorial a go, so don’t forget to share your makes in the Inspiration area and to #Trimcraft when uploading to social media! You can also find Christine on Instagram, so why not give her a follow to see more wonderful projects?